Flooring projects present homeowners with a wide range of choices in materials and services. Wood floors may be made from hardwoods or softwoods, manufactured products or bamboo. There are multiple types of vinyl, rubber and other synthetic materials available to provide resilient residential and commercial floors. Our mission is to provide you with straightforward tools to help you select the most appropriate products and services within your budget. We can also help you understand the regulations and resources available to help with hiring flooring contractors in your state. Confused about your flooring warranty? 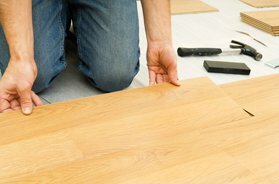 This article explains how (and when) flooring materials and labor are guaranteed by their manufacturers and installers. For the past 5 years, Flooring.net has been collecting consumer reviews of hardwood flooring, carpeting, laminate, vinyl, linoleum, and tile. Read reviews written by other flooring customers or submit one of your own. There are various issues regarding flooring contractors that will be specific only to your home state. State-specific issues that commonly arise include government regulations, how to lookup licensing status, where to file a complaint, and the local climate's effect on flooring.